Glenn Ferguson intends to make some changes to his Ballymena United line-up for tonight's County Antrim Shield tie against Glebe Rangers. Picture: Press Eye. 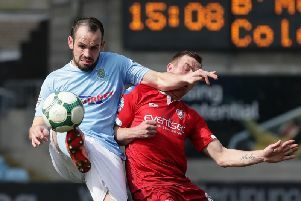 Ballymena United manager Glenn Ferguson is ready to make change as his side begins its County Antrim Shield campaign tonight (Tuesday). Ferguson won’t risk a number of senior players who are carrying injuries as they take on Championship Two Glebe Rangers at the Showgrounds (7.45pm). “The two Scottish boys (Gareth Rodger and Allan Jenkins) won’t come over,” confirmed Ferguson. “There are boys who are carrying a few knocks. Matthew Tipton is struggling and we’ll see how Matthew Shevlin’s facial injury is. “We have enough here that are busting to play and need to play and are good enough to beat Glebe, I would think and hope. After tonight’s game, Ferguson will turn his attention back to United’s Danske Bank Premiership campaign which continues wit ha trip to Warrenpoint Town on Saturday (3pm). Gareth Rodger’s injury time equaliser at Ballinamallard at the weekend preserved United’s eighth place position in the league table and stopped them from being overtaken by the Fermanagh side. “We will need to play better at Warrenpoint as they are a much better footballing side so we will need to play a lot better than that,” said Ferguson. Seven Towers Supporters’ Club transport for Warrenpoint leaves Henry Street car park at 1.15pm. The club’s Joker promotion will be drawn prior to departure.